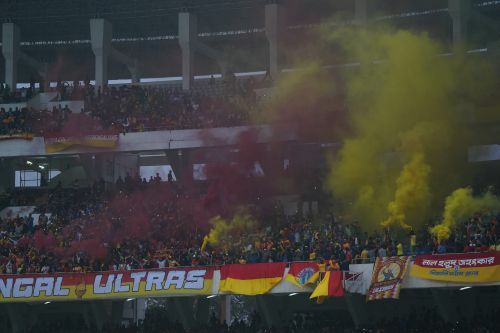 East Bengal defeated Mohun Bagan 2-0 in the second I-League Kolkata Derby to keep their title hopes alive. Joby Justin and Jaime Santos Colado's goals were enough to send the Red and Gold fans in euphoria and Green and Maroon fans in despair. However, this win doesn't change East Bengal's fourth position in the points table as they are still behind Real Kashmir on goal difference. Mohun Bagan, on the other hand, remain on the sixth spot with 21 points from 14 matches. Khalid Jamil made two changes to the Mohun Bagan side that defeated NEROCA 1-0. Yuta Kinowaki and Azharuddin Mallick sat on the bench as Pintu Mohata and Henry Kisekka found their name in the starting lineup. 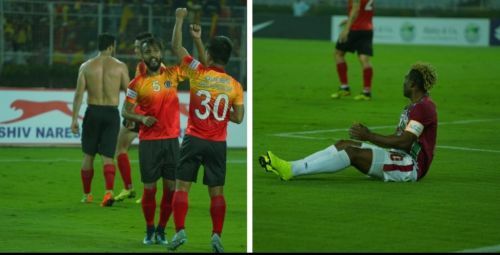 East Bengal's Spanish coach Alejandro Menendez, on the other hand, was forced to take out Manoj Mohammed owing to suspension. Lalrindika Ralte, who was given the captain's armband, returned in the playing eleven. The game was a topsy-turvy encounter with the 62,629 fans on the edge of their seat, cheering for their respective teams. On that note let us take a look at the five talking points from today's game. If the second half and the last fifteen minutes of the game was filled with high-octave drama and thrilling action, both the teams took a cautious approach in the opening thirty minutes of the game. There were only two shots on target in the aforementioned time period, both of which were straight to the goalkeeper. It was wise for both the sides to read the game and learn the opponents' tactics, so that they could exploit them as the match grew. The cautious approach in the first thirty minutes favored East Bengal as they outclassed Mohun Bagan on every department in the later sixty minutes of the game. Unfortunately for the Mariners, they played into the Red and Gold Brigade's sleeves and came second-best.